Again we made our annual trip to our property in Tennessee although this time it would be different for us. 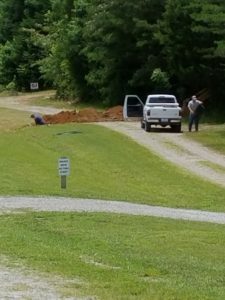 It was time to clear the property and install the septic system. We needed to be there to decide what areas we wanted cleared of underbrush,many small saplings, and a couple of dead trees. After arriving on a rainy Monday afternoon in Livingston we had lunch at a local downtown diner. It was a great little spot with an adjoining antique shop. You can find more about that on Cheri’s Blog. Early Tuesday morning we met with our Contractor, Benton Tucker with Tucker Farms LLC and his associate Jason Huggins at another local diner for breakfast. These guys made us feel welcomed and happy to do business with them. During breakfast and between a few laughs we explained what we were looking for and decided to head out to the property and create a plan for tomorrows work. We needed to decide where to clear for the septic system according to the Inspectors permit we had received. 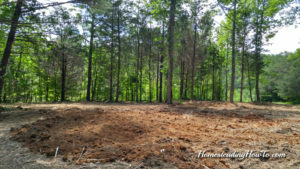 The permits will usually give you some idea of where the Inspector conducted the percolation test on the property and where the tank and drain field would need to be. It was also important in knowing where we would be able to place our future home, placing utilities, driveways, gardens and other outbuildings we may have later. We walked the property with Benton and Jason while they provided some expertise and valuable insights of things we could consider. At the end of our walk we knew we would have a much better idea and vision once their equipment was on-site and the clearing began. On Wednesday morning, after a short delay due to a flat tire on one of their trailers they arrived and began work immediately. Jason began work with the Forestry Mulcher clearing some of the property. This would allow us to get in much easier beyond the underbrush and briars. 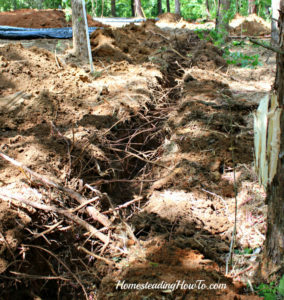 It would also help in clearing for the septic system. We were fortunate enough that Benton had already contacted the State Inspector to come out and inspect the installation and hopefully give us a completion permit. The Inspector arrived much earlier than planned and decided to hang out with us for awhile while the digging and measuring continued and wait for the septic tank to arrive. We had purchased a 1000 gallon Low Boy concrete septic tank for the system with a gravel- less drain field system approved by the State Environmental Health Inspector. These tanks need to be buried on site at least 6 feet in depth and level. That is normally the depth of these tanks. It will provide that the tank is level and will drain properly. For accuracy, our Contractor used a transit to measure the depths while being dug by the excavator. The top of the tank being close to ground level also provides easy access to the tank when its time to pump it out to remove waste. The Inspector informed me that our tank would more than likely only need to be pumped out once every 10 years or so. Much of that depends on use. Now the septic tank is ready to lower into the ground..
Around noon the truck with the septic system arrived on-site and the work began to lower it into place and make sure it was level. Once the tank was in place it was now time for the excavator operated by Cody ( another Tucker Farms Equipment Operator) to dig another trench for the drain field piping and gravel-less pipe. The permit called for 110 feet of gravel-less pipe which would stretch across the front of the property. This will allow any liquids accumulated in the septic tank to flow through the pipe to the drain field and be absorbed into the ground. The piping and the ground will filter the liquids and pretty well render it harmless. In the below photograph you can see the gravel- less pipe in the foreground. It is nothing more than flexible perforated piping wrapped in a mesh sleeve and then outer wrapped in black plastic. Gravel-less pipe replaces the need to haul in gravel to put in the trench for the absorption process in waste treatment. 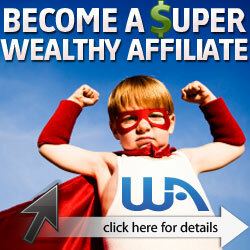 It seems to be much quicker and less expensive than a several hundred dollar truck load of gravel. 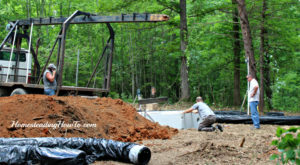 Once the tank was installed in the ground they began digging the trench for the drain field piping. In our case the trench needed to be 110 feet long and a few feet deep. 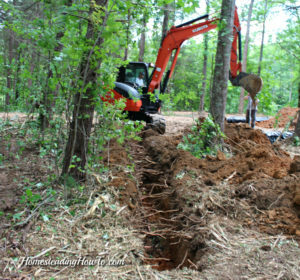 This would eventually tie into the septic tank by a section of PVC pipe to the drain field. This allows the liquids to reach the drain field for absorption. Many times the drain fields are commonly called leech fields. Once the trench is completely dug the tree roots will be removed to make installing the piping easier and clear of debris. They removed those with a cordless sawzall. Some prefer to simply remove them with a pair of loppers. Once the system is in the ground you will need a local Health Department Inspector to come out and inspect the installation to make sure it meets code and will work properly. After it is inspected and passes, the Contractors will then cover it up. The Inspector would then give us a Certificate of Completion for our records and it meets code. We will also need this Certificate for the Electrical Permit. Now that our septic system is installed it is important to remember that in many locales it is required to have septic systems installed by a Licensed Contractor in your particular state. Many of these same locations require you to have an approved method of disposing of waste, especially human waste. The reason is simply that disposing of waste improperly allows the ground water ( aquifers)to be contaminated with human waste. Many aquifers are our main source of drinking water who use wells for water sources. Home made septic systems don’t always purify our drinking water. Many locales also allow approved composting toilets for disposal as long as running water is available to you. You can be sure that if you are ever found in violation with a home made system you can face heavy fines and penalties. Please do the right thing and install an approved septic system. Our health depends on it! Check your local codes or with your local Health Department to find out what is approved and not approved in your area. By the way, our water meter was installed this past week much to our surprise! Be sure to visit Cheri’s Blog to read her take on our complete trip to our Homestead and things we did on our down time.